Paul Heyman has done it all in wrestling - announcer, booker, manager, photographer, promoter. There was even that time he arm-wrestled Missy Hyatt! 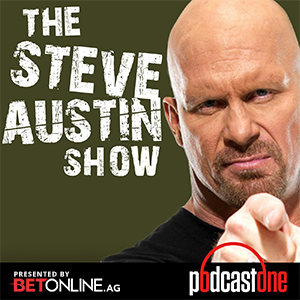 On this classic episode of THE STEVE AUSTIN SHOW, Steve sits down with his former manager in the Dangerous Alliance to talk about breaking into the industry as a ringside photographer, becoming a booker in Chicago then Continental and working with the late Eddie Gilbert. The duo also break down the 2014 feud between Brock Lesnar and John Cena as they head into WWE Night of Champions 2014. Head over to BetOnline.AG and use promo code BIG GAME to enter for a chance to win a trip to the NFL's biggest game of the year in Atlanta!